This article is a short summary of Fire Emblem: The Sacred Stones. 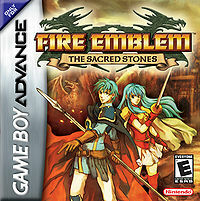 Fire Emblem: The Sacred Stones is the eighth installment in the Fire Emblem series, released in 2004 for the Game Boy Advance. The game is set on the world of Magvel, and stars a cast of brand new characters after the release of Fire Emblem. In Europe, this game was released alongside the following game, Fire Emblem: Path of Radiance. The game was re-released as a limited promotion for the Nintendo 3DS Ambassador Program in 2011, before finally being re-released on Wii U Virtual Console in 2014 in Japan and 2015 internationally. Fire Emblem: The Sacred Stones plays much like any other Fire Emblem or Advance Wars game, being a tactical-role playing game, you control a small group of units around a map to defeat enemies. Victory can be won in several different ways, often changing with each map. This page was last edited on 1 December 2015, at 19:01.